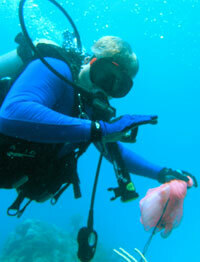 Lonny has been with Florida Keys National Marine Sanctuary since 2007 as a member of the science team. Much of his time is spent assessing damage cause by vessel groundings, and developing and implementing restoration strategies for these impacts to sanctuary resources. His other duties include assisting with ongoing sanctuary research projects as well as serving as the unit diving safety officer and overseeing all aspects of the scuba diving activities undertaken by Florida Department of Environmental Protection employees at the sanctuary. Lonny moved to the Florida Keys in 1990 to join the Florida Fish and Wildlife Research Institute (FWRI) queen conch enhancement program. During his 18 years with FWRI, he participated in various research projects including queen conch stock assessment and enhancement from Miami to the Dry Tortugas and Caribbean spiny lobster and fish population dynamics. In 1998, Lonny progressed into a full-time marine biologist position at the Keys Marine Laboratory (KML). While there, he assisted visiting scientists with their research projects and also held the position of Unit Dive Safety Officer. Over the years at KML, he was invited to participate in the FWRI's Coral Reef Monitoring Program, which allowed him to become more familiar with the Florida Keys reef tract and the various factors that influence coral reef health.